Hi, my name is Anjali Atluru and I am a freshman at The University of Georgia, majoring in Business Administration. I first started modeling through community cultural associations such as TANA and NATA. This past year I won Miss Teen Tana ATL 2017. I am currently modeling for Bethe You by Shaveta and Anuj Jain. Modeling has been the perfect platform for me to express myself through the innovative world of fashion. I cannot wait for what the industry has in hold for me. When I’m not at school or modeling, I also volunteer with tutoring and mentoring underprivileged children in their academics. Education is very important and very much needed, and through Mentor Me I help make a difference for these students. My name is Arisha Captain. I am a senior at Peachtree Ridge High School. I am an honor roll student .My hobbies are shopping and dancing.I have learnt dance from Kruti and Prem dancing school.I volunteer for honor society for my school. Also I am a volunteer and councilor for Agha khan foundation and partnership-walk.I won my FIRST crown as runner up for Miss Teen Georgia 2016 and Top 5 Miss USA 2016!!! I want to become a doctor and serve the community, give back what I have been blessed with so far. Fashion designing and modelling is my passion ! I am modelling for Shaveta Jain , Calvin Johnson and Ramzan Virani. I’m Sumana Goswami, a fashion model. I was DeshVidesh cover model for last year Florida edition. I have participated in Indian and American fashion shows. I currently walk the ramp for Be The You by Shaveta Jain and also do freelance modeling and fashion photo shoots. To date I have worked with Anuj Jain photography, Hardman Portraits, Atin’s photography, Calvin Johnson and a few others. Proud to represent BeTheYou. My hobbies include Modeling as well as make up artistry. I have had an interest in design, fashion, and beauty since a young age. I am thankful for these experiences for many things but one important one being that it helped me build lifelong friendships with incredible women. I hope to keep learning and growing within this industry as well as inspire others to gain confidence. There is nothing more powerful than a woman who knows her worth! Mrs. Shaveta Jain is a Founder/Director of imaging and empowerment firm Bethe- You. She is also the National Director for Mrs. India USA Universe at Mrs. Universe Ltd. She is an International beauty pageant winner, crowned as Mrs. India International in 2012 and later appointed as its Global Brand Ambassador. She is spokesperson for various National and International NPOs. As a Founder/Director of “BetheYou”, she has worked with over 70 young girls and women alike by exposing them to opportunities to walk the Runway with elegance, style and glamor, in turn boosting their confidence and self-esteem with these enriching experiences. The firm has successfully conceived and produced over a dozen Runway Fashion Shows and Photoshoots in conjunction with local businesses, entrepreneurs, media companies for various events, including the First Ever Indian Bridal Segment for GA Peach Fashion Week and Goodbye Designers Convention. She believes it is only meaningful to be powerful if you can use your power to empower others! She is happy and proud to be bringing a Bridal segment for DeshVidesh Bridal Show Atlanta second time in a row. Henna is a rising HS Senior with passion for math and computer science and has completed related programs at Emory University and Georgia Tech. She has a passion for singing and has performed on stage for multiple audiences. Having won the crown for Miss Teen India GA 2016 as First Runner-Up, she continued to compete in Miss Teen India USA 2016 in NYC. With her crown, Henna has had the privilege to represent the Indian community at various events including the Indian Republic Day Celebration, Roswell City Hall Meeting, and State Congressman Fund raiser. She has also been featured in local and national media. 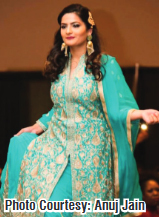 Her runway experience includes showcasing outfits of both Indian and American designers, and modeling for numerous fashion shows and photo shoots. As a role-model, Henna leads weekly monitoring sessions to build confidence and self-esteem in young girls. Her aspiration are to receive a degree in computer engineering, continue modeling, singing, and above all, be an outstanding citizen and role-model for her two sisters and all other girls!! Hello My name is Tina Mir. I come from a multicultural family where my mother side is Indian and father side Persian. I love my Indian culture so much that I’ve always wanted to stay involved with it. I’m a former beauty pageant winner for Mrs India Georgia 2016. I was crowned as Miss Beautiful Hair and Mrs India Georgia 2nd runner up. Acting and modeling are my biggest passion. I’ve been to a few fashion runway shows, magazine photo shoots and music videos. I’m blessed to say that pretty soon I’ll be pursuing my acting career in Bollywood by accepting movie offers from Mumbai production companies. Katy Plant is going into her sophomore year at the University of Georgia, intending for a double major of Journalism and Film Studies. She is also a member of the UGA Club Swim Team in which she will be entering her tenth year in the sport of swimming. Katy has actively pursued photography and film her entire life, and began modeling with Be The You in summer 2016. Since then, she’s been in four fashion shows and three makeup shoots. She hopes to continue modeling casually as she pursues the field of filmmaking. 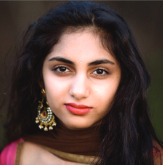 Diya Sharma is a sophomore at Georgia Tech studying biochemistry and pre-medical sciences. She is on the dance team, ATL Tanishq and is an ambassador for TedX Georgia Tech. She won the title of Miss IACA Teen GA in 2014 and has been modeling ever since. She has participated in several bridal as well as casual shoots and hopes to model her way through medical school. She is a consistent volunteer for Vibha, Meals By Grace, and Northside Hospital. She currently works at a pediatric dentistry furthering her love and passion for working with children. My name is Crystal Favorito. I am a 15 year old sophomore at Centennial High School. I am Miss Teen India Georgia and Miss Teen India USA 1st Runner Up. 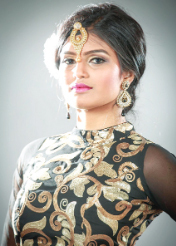 I am a #BetheYou model under Shaveta Jain and have taken part in Atlanta’s Global Fashion Show and Vibha Vibe. I have volunteered with the Jon Ossoff for Congress campaign and I have hosted two blood drives at my high school. I also spent the summer in India working in a hospital. Sahithi Boddireddy is a Junior at South Forsyth High School. She is an exemplary student and an outstanding school leader. She volunteers for honour societies with in her school and for local organizations throughout her community. She aspires to be a neurosurgeon when she grows up, therefore she takes part of HOSA, a healthcare club at her school. She placed 2nd in the state, and top 15 in the nation in the competitive events held by HOSA this year. She is also a youth leader for ATA, a national organization that represents her culture. She loves dancing and modeling. She has learnt dance from Shivs Institute of dance and took part in many competitions. She was introduced to modeling through the 2015 IACA pagaent. She has won people’s choice award in the 2015 IACA pageant and has won the title in the Neeru’s fashion show held at the 2016 ATA convention. For the past year and a half, she has been representing Betheyou by Shavetha and Anuj Jain as a model. This experience has given her a new perspective and an opportunity to express herself. This platform has helped mold herself into the person she has become and she is eager to continue striving to reach her full potential. My name is Zoha Siddiqui. This school year, I will be a sophomore in College, I am majoring in nursing. I am also currently working at Audi. Modeling and doing photoshoots has always been the one thing I have loved doing the most and still love doing. As a little girl I use to walk around the house in heels and have my siblings take pictures of me. I started doing fashion shows and photoshoots back in 2014 and have been in multiple shows like Desh-Videsh, Bridal shows, AAPNA and a couple other more. I also have have done photoshoots for some retail stores and business companies. I love modeling and also photoshoots, I have had the best experiences everytime I do a show or shoot. I volunteer at Emory Johns Creek Hospital to get some experience, visualization, and hours, since they are required for the medical field.